What Are the Workplace Hazards That Lead to Landscaper Injuries and Workers’ Compensation Claims? Landscapers must often work in extreme weather, and their duties are very physically demanding. They provide many vital services to businesses and property owners, such as fertilizing and cutting lawns, planting trees and other plants, maintaining golf courses, trimming trees, and more. However they face numerous hazards on the job that can cause them to suffer serious injuries or death. While many landscapers are independent contractors, others are employees and may be entitled to workers’ compensation benefits if they become hurt on the job. What Types of Dangers Do Workers in the Landscaping Industry Face? Transportation accidents. Landscape workers must travel between jobs, often driving large trucks or pick-ups with attached trailers. Jackknife accident where the trailer swings into other lanes of traffic are common and can result in a multi-vehicle pileup. Employees can suffer long-term injuries or death in vehicle accidents while going to the next worksite. Struck by or caught between objects. Workers can be crushed by or caught between heavy machinery, like riding lawnmowers, tractors, and backhoes, or they can be hit by large tree branches, trees, or other objects. Some of the injuries caused by these accidents can result in long-term disabilities or death. Slips and falls. Falls are among the most common workplace dangers for landscapers. Dangers can include falling from a tree, ladder, deck, or other height, or slipping and falling on wet grass or other surfaces. Workers can suffer debilitating back, shoulder, or spinal injuries or head injuries that can make it impossible for them to continue working. Extreme weather. Workers do not have the luxury of working only when the weather is nice. They risk heat-related illnesses, such as heat exhaustion and heat stroke, in the hot summer months. Electrical accidents. When landscapers dig near electrical wires, come in contact with overhead electrical lines, or work with defective tools using electricity, they can suffer an electrical shock or electrocution. Power tools. 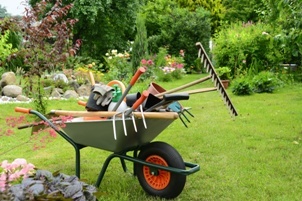 Landscapers work with a variety of power tools, including lawnmowers, chainsaws, and tree trimmers. When an accident happens, a worker can suffer serious lacerations, burns, eye injuries, broken bones, and amputations. Chemicals. Landscapers are exposed to toxic chemicals in the fertilizers, weed killers, and other chemicals they use during their workday. This long-term exposure can cause them to develop occupational illnesses, such as respiratory illnesses or cancer. Insect bites. Landscapers are at risk of mosquito, bee, spider, wasp, and other insect bites. With the dangers of contracting the Zika virus and other illnesses from insect bites, this is becoming a more serious worry for these employees. Filing a workers’ compensation claim. If the landscaper is an employee, he may be entitled to workers’ compensation benefits to pay for his medical bills and lost wages. Workers' comp benefits can also pay the worker for a partial or permanent disability or death benefits to family members if a loved one died as a result of his accident. A person could be entitled to benefits even if his own negligence caused his injuries because a worker is entitled to benefits in New Jersey regardless of fault. Personal injury claim. In some cases, an employee also has a claim against a negligent third-party. For example, if another driver caused a vehicle accident, a landscaper can file a claim with the driver’s insurance company. He could have a products liability claim against a manufacturer of defective machinery or power tools if this caused his accident. Pursuing these claims as well as a workers’ compensation claim can ensure that the worker is fully compensated for his injuries, including for the pain and suffering he endured. Did you suffer an injury in a landscaping accident? Manfred Ricciardelli is here to help you obtain the workers’ compensation benefits and other compensation you could deserve. Start an online chat to schedule your free consultation to start learning about your legal options.